Hello lovely readers. Are you a fan of jellies? Today I have some gorgeous Glam and Glitz Ink swatches to show you. All four of these gel polishes have jelly bases that are packed full of shimmer. The jelly base gives them tons of dimension and major wow factor. As jellies, they are a bit on the sheer side. So if you're not a fan of vnl (visible nail line), you'll want to layer them over an opaque base. I have to admit, Ink is one of my top five favorite brands. While it's not a highly recognized brand like Gelish or LeChat, it is a high quality salon brand that ranks above those other two in my list of favorites. Not only do they have a huge color selection, but application is a breeze, wear is great, soak off is super fast, and the price is well below some of the other brands in my collection. I have quite a few Ink polishes and am slowly working my way through swatching them. The first polish I have to show you is Ink Vamp. Vamp is a dusty orange jelly base with a golden orange shimmer. The next polish I have to show you is Ink Psychedelic. Psychedelic is a blue jelly base with shimmer that shifts from green to gold. My camera refused to capture the shift in the shimmer. I took a slightly blurred close up of Psychedelic on a swatch stick and managed to capture it just a little. I promise, it is much better in person. Next up is Ink Pink Lush. This one wreaks havoc on my swatch ring organization. Some days I want to call it a coral leaning pink and place it with my pinks. Other days I think it is a pink leaning coral and want to put it with my corals. In reality, I think it is a pink jelly base with a shimmer that shifts from pink to coral. Finally, my favorite of the four is Ink Captivate. 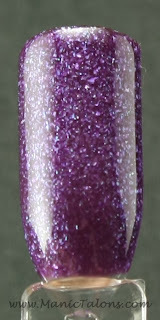 Captivate is a dark purple jelly base with larger, irregular shimmer pieces. The result of this combo is a polish with so much dimension I can't even think of how to describe it. I took a close up of the swatch stick for this one too so you can see the irregular shimmer much better. Cool beans Michelle. Love that you highlighted jelly finishes because they add another layer of dimension to soak off gel manicures. It would be fun to see another article about stamping in layers, foils in layers etc. to show us the versatility of these bad boys. And oh yeah, digging Captivate. Can We strike up a deal where you give me a list of suggesrions and I run with them each month? lol The last suggestion you made ended up being one of my most popular topics. :) I'll add this one to my list! Love to. The name CuriousCreature is there for a reason. I like to read about and test all sorts of variations. Just today I layered 1 coat of Cirque's French Roast on top of a full SOG (CND's Black Pool) waited to dry then topped with SOG t/c. It created this edgy brown/black combo. I love how SOG has made RNP more wearable.